Why are methane levels over the Arctic Ocean high from October to March? Why are methane concentrations in the atmosphere over the Arctic Ocean so high from October through to March? 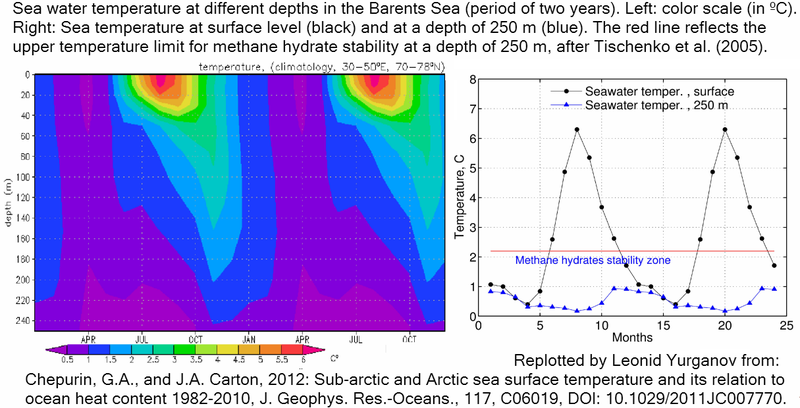 The image below, replotted by Leonid Yurganov from a study by Chepurin et al, shows sea water temperature at different depths in the Barents Sea. Above image illustrates that, while Arctic sea water at the surface reaches its highest temperatures in the months from July to September, water at greater depth reaches its highest temperature in the months from October to March. Accordingly, huge amounts of methane are starting to get released from the Arctic Ocean's seafloor in October. At the same time, continents around the Arctic Ocean are frozen. Surface temperatures over the Arctic Ocean were higher than temperatures on land at the end of October, due to the enormous amounts of heat being transferred from the waters of the Arctic Ocean to the atmosphere. This was the result of ocean heat content, which in 2014 was the highest on record, especially in the Arctic Ocean, which also made that at that time of year the sea ice extent was still minimal in extent and especially in volume. In October, the Arctic Ocean typically freezes over, so less heat will from then on be able to escape to the atmosphere. Sealed off from the atmosphere by sea ice, greater mixing of heat in the water will occur down to the seafloor of the Arctic Ocean. The sea ice also seals the water of the Arctic Ocean off from precipitation, so no more fresh water will be added to the Arctic Ocean due to rain falling or snow melting on the water. In October, temperatures on land around the Arctic Ocean will have fallen below freezing point, so less fresh water will flow from glaciers and rivers into the Arctic Ocean. At that time of year, melting of sea ice has also stopped, so fresh water from melting sea ice is no longer added to the Arctic Ocean either. As addition of fresh water ends, the salt content of the water in the Arctic Ocean starts to rise accordingly, while the Gulf Stream continues to push salty water into the Arctic Ocean. The higher salt content of the water makes it easier for ice to melt at the seafloor of the Arctic Ocean. Saltier water causes ice in cracks and passages in sediments at the seafloor of the Arctic Ocean to melt, allowing methane contained in the sediment to escape. Besides heat, open water also transfers more moisture to the air. The greater presence of sea ice from October onward acts as a seal, making that less moisture will evaporate from the water. Less moisture evaporating, together with the change of seasons (i.e. less sunshine) results in lower hydroxyl levels in the atmosphere at the higher latitudes of the Northern Hemisphere, in turn resulting in less methane being broken down in the atmosphere over the Arctic. 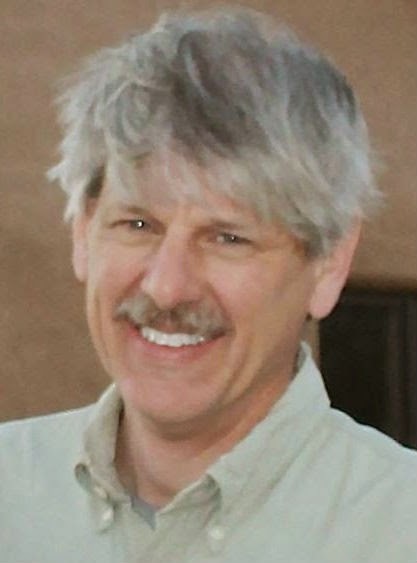 Malcolm Light writes in this and this earlier posts that the volume transport of the Gulf Stream has increased by three times since the 1940's, due to the rising atmospheric pressure difference set up between the polluted, greenhouse gas rich air above North America and the marine Atlantic Air. The increasingly heated Gulf Stream with its associated high winds and energy rich weather systems then flows NE to Europe where it is increasingly pummeling Great Britain with catastrophic storms, as also described in this earlier post, which adds that faster winds means more water evaporation, and warmer air holds more water vapor, so this can result in huge rainstorms that can rapidly devastate the integrity of the ice. 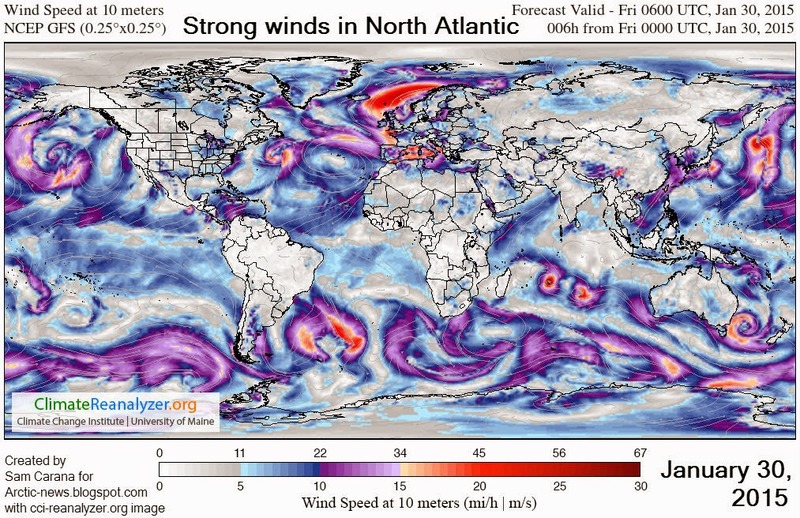 The image below further illustrates the danger of strong winds over the North Atlantic reaching the Arctic. Branches of the Gulf Stream then enter the Arctic and disassociate the subsea Arctic methane hydrate seals on subsea and deep high - pressure mantle methane reservoirs below the Eurasian Basin - Laptev Sea transition. 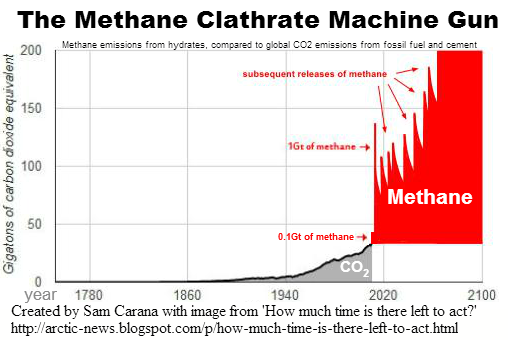 This is releasing increasing amounts of methane into the atmosphere where they contribute to anomalously high local temperatures, greater than 20°C above average. 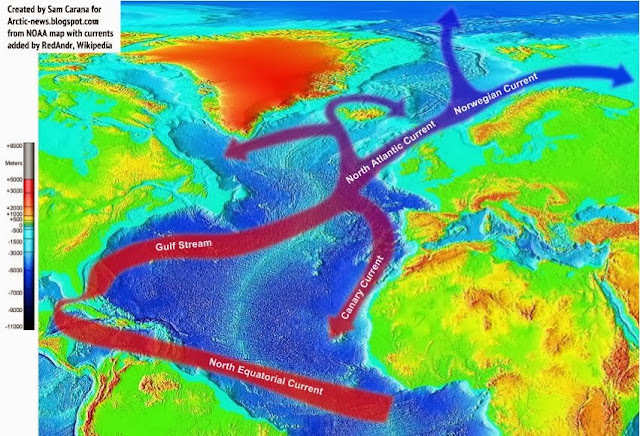 Emissions from North America are - due to the Coriolis effect - moving over areas off the North American coast in the path of the Gulf Stream (see animation on the right). The Gulf Stream reaches its maximum temperatures off the North American coast in July. It can take almost four months for this heat to travel along the Gulf Coast and reach the Arctic Ocean, i.e. water warmed up off Florida in early July may only reach waters beyond Svalbard by the end of October. Waters close to Svalbard reached temperatures as high as 63.5°F (17.5°C) on September 1, 2014 (green circle). The image below shows sea surface temperatures only - at greater depths (say about 300 m), the Gulf Stream can push even warmer water through the Greenland Sea than temperatures at the sea surface. Since the passage west of Svalbard is rather shallow, a lot of this very warm water comes to the surface at that spot, resulting in an anomaly of 11.9°C. The high sea surface temperatures west of Svalbard thus show that the Gulf Stream can carry very warm water (warmer than 17°C) at greater depths and is pushing this underneath the sea ice north of Svalbard. This situation continues until March, when the sea ice starts to retreat and more hydroxyl starts getting produced in the atmosphere. Increased sea ice melt and glaciers melt, the latter resulting in warmer water flowing into the Arctic Ocean from rivers, will cause salinity levels in the Arctic Ocean to fall, in turn causing methane levels to fall in the atmosphere over the Arctic Ocean. Furthermore, the water traveling along the Gulf Stream and arriving in the Arctic Ocean in March will be relatively cold. The Norwegian Svalbard Islands are located just few hundred miles from the North Pole. It is a unique environment for glaciers: Here glaciers can survive almost at sea level. This means that ice is constantly brushed by thick low-altitude air, which also dumps increasinlgy rain instead of snow. As a result of high ocean temperatures and of precipitation nowadays falling as rain for months, the melting of these glaciers now occurs 25 times faster than just some years ago. This also spells bad news for Northern Greenland's low lying glaciers, which will face increasing summertime flash floods as the Arctic Ocean becomes ice free and warms up, and as precipitation falls in the form of rain, rather than snow. Last summer, for example, sea water west of the Svalbard reached +18C, which is perfect for swimming - but extremely bad for the cold glaciers on shore which mop up the warm moisture and rainfall from the warmed up ocean. Flash floods falling on glacier soften the compacted snow very rapidly to honeycombed ice that is exceedingly watery and without any internal strength. Such ice can collapse simply under its own weight and the pulverised watery ice in the basin forms a near frictionless layer of debris. 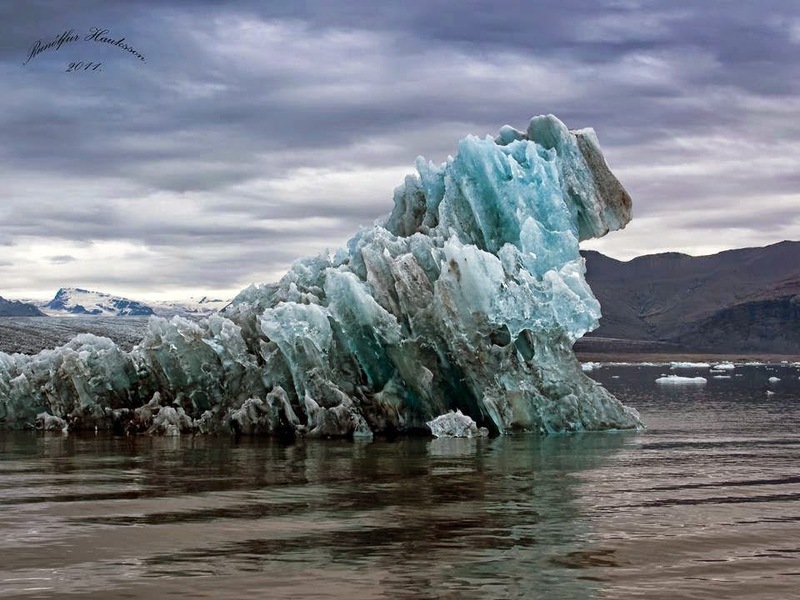 Darkening of the melting ice also hastens its warming and melting. As the Arctic continues to warm, the temperature difference between the equator and the Arctic declines. This slows down the speed at which the polar vortex and jet streams circumnavigate the globe and results in more wavier jet streams that can enter and even cross the Arctic Ocean and can also descend deep down over the continents, rather than staying between 50 and 60 degrees latitude, where the polar jet streams used to be (as discussed in a recent post). Such deep descent over continents can cause very low temperatures on land, while at the same time oceans remain warm and are getting warmer, so the temperature difference between land and ocean increases, speeding up the winds between continents. 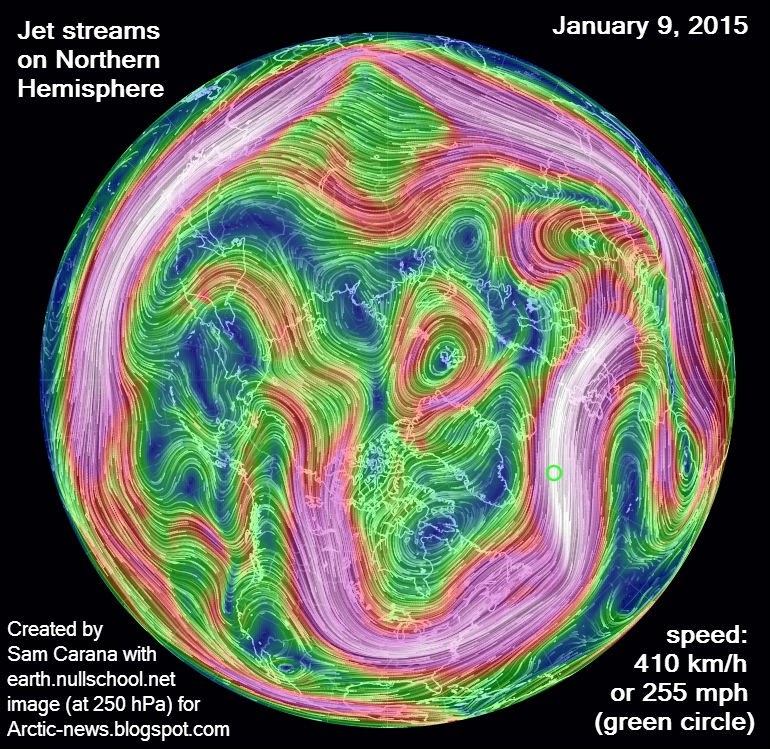 On January 9, 2015, jet streams reached speeds between continents as high as 410 km/h (255 mps), as shown on above image. Also note the jet stream crossing the Arctic Ocean. Faster winds means more water evaporation, and warmer air holds more water vapor, so this can result in huge rainstorms that can rapidly devastate the integrity of the ice. I suspect that climatically-speaking we are currently entering a methane-driven Bøllinger warming state with the Northern Cryosphere now entering a phase of rapid warming and melting of anything frozen (snow, sea ice, permafrost and sea bed methane clathrates). This will be rapidly followed by a Heindrich Iceberg Calving event when the warmed and wet ice sheet in Greenland gives away to its increased weight (due to excessive melt water accumulation within and beneath the ice sheet). This dislodges the ice sheet’s top, due to accumulation of “rotten ice” (honeycombed, soft ice with zero internal strength) at the ice sheet’s base and perimeters. A huge melt water pulse to the ocean ensues with Jōkullhaups and ice debris loading the ocean with vast amounts of cold fresh water. Within weeks an immense climatological reversal then occurs as the ocean gets loaded up with ice debris and cold water leading to the Last Dryas cooling and to world-wide droughts. This loading of the ocean with ice and water leads to severe climatic flop, as the ocean and atmosphere cool rapidly and as falling salinity and sea water temperature briefly reverse all of the current Bøllinger warming, until the climatic forcing of the greenhouse gases again takes over the process, in turn leading to a new melt water pulse as another ice sheet or shelf disintegrates by the next warming. Today’s rapid melt water lake formation in Greenland and the ultra-fast melting of glaciers are suggestive of near imminent deglaciation process in the Arctic. Germany’s and Japan’s recent decisions to remove all their nuclear reactors from the sea sides may prove their worth sooner than many think in the far more conservative US and UK where “glacial speed” still means “eons of time”. Good luck UK/US! 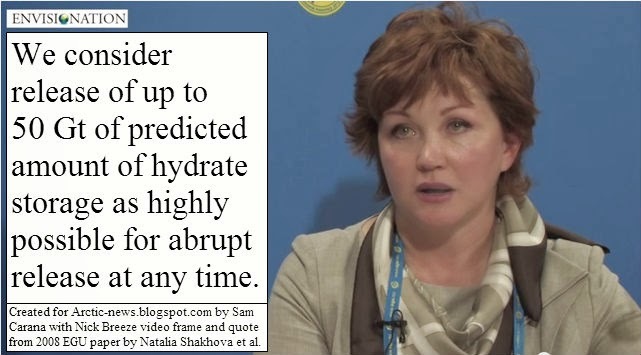 I think cold 'Dryases' are not real Ice Ages, but hiatuses in a progressive melting process which results from changes in sea water salinity and temperature due to increases of meltwater and ice debris runoff from continental snow and ice that melt. As ocean gets less saline and colder the sea ice and snow cover temporarily grows. 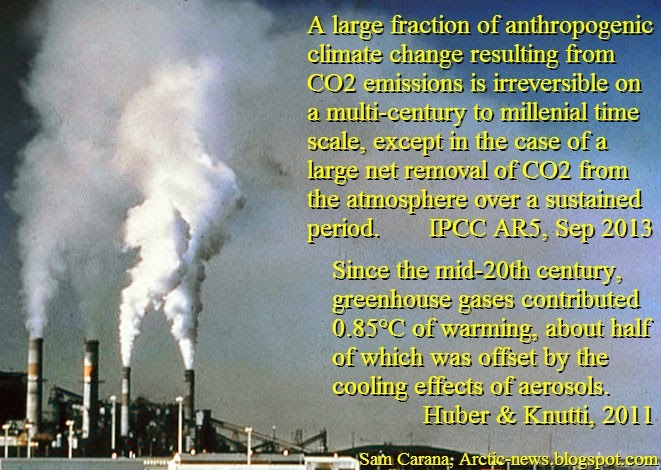 But in the long run the greenhouse gas forcing and ocean wins and the warmth and melting resumes until the next big collapse of ice shelf and/or ice sheet. Hence there are meltwater pulses (such as 1a, 1b, 1c) and Heindrich Ice Berg Calving surges (2, 1, 0 - the last one being also called "Younger Dryas" as the Arctic Dryas octopetala grew in South once again after Ice Ages). The next cooling from collapse of Greenland ice dome would be Heindrich Minus One as the zero has already been allocated to Younger Dryas ice berg surge. Here is an article worth reading on this risk. In Antarctica we see currently (already) a sea ice growth hiatus driven by increased runoff of melt water and ice debris from the continent and its surrounding ice shelves that are rapidly disintegrating. A 2008 study by Achim Brauer et al. of lake sediments concluded that abrupt increase in storminess during the autumn to spring seasons, occurring from one year to the next at 12,679 yr BP. This caused abrupt change in the North Atlantic westerlies towards a stronger and more zonal jet, leading to deglaciation. A 2009 study by Jostein Bakke et al. confirmed that increased flux of fresh meltwater to the ocean repeatedly resulted in the formation of more extensive sea ice that pushed the jet south once more, thus re-establishing the stadial state. Rapid oscillations took place until the system finally switched to the interglacial state at the onset of the Holocene. - An abrupt wind shift in western Europe at the onset of the Younger Dryas cold period, Brauer et al. - Rapid oceanic and atmospheric changes during the Younger Dryas cold period, Bakke et al. 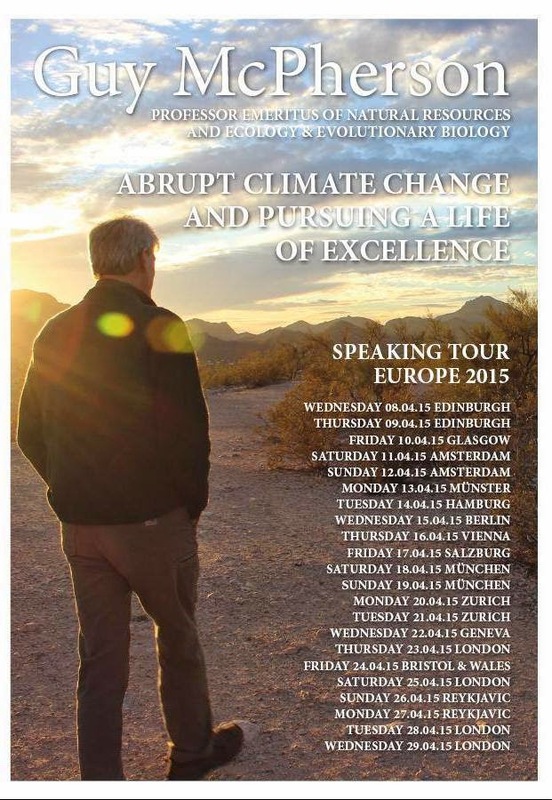 Andrew Harvey, founder & director of the Institute for Sacred Activism, interviews Dr. Guy McPherson on the topic of how to live with death in mind. Harvey reads excerpts from his foreword in Dr. McPherson and Carolyn Baker's new book, 'Extinction Dialogs: How to Live With Death in Mind'. 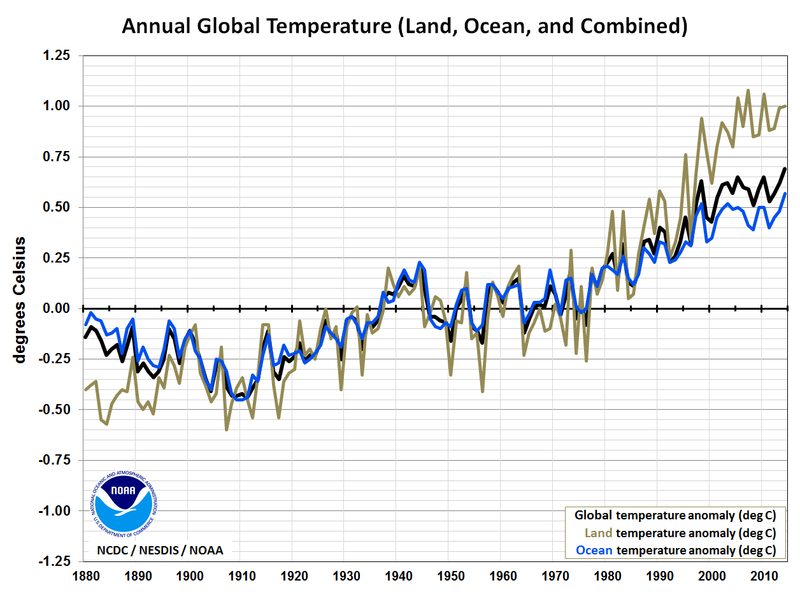 The year 2014 was the warmest year across global land and ocean surfaces since records began in 1880, writes NOAA, adding the graph below. This graph illustrates that temperatures have risen even when focusing on a relatively short recent period with a linear trendline starting in 1998, which was an El Niño year, whereas 2014 wasn't. While the purple 1998-2014 trendline serves the useful purpose of dispelling the myth that warming had halted recently, it isn't the most appropriate trendline, since extending this trendline backward to 1880 would leave too many data too remote from the trendline, as is further illustrated by the animated image below. What about the blue linear trendline that is based on data for all the years from 1880 to 2014? By that same logic, the appropriateness of this trendline must also be questioned. 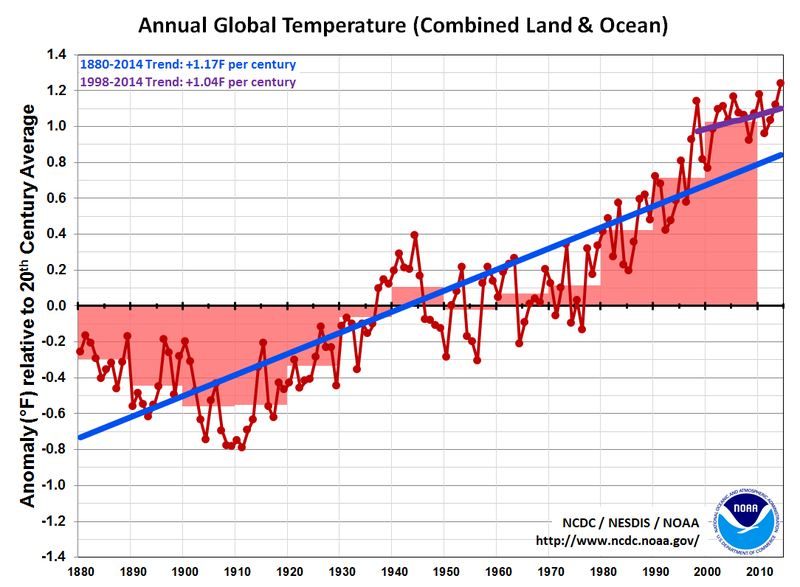 Temperatures in recent years have been well above this trendline. A polynomial trendline seems a much better fit, as illustrated by the image below. Above image also extends the trendline forward, showing that 2 degrees Celsius warming looks set to be exceeded in 2038, based on the same data. And while this is a frightening scenario, the picture may well be much too optimistic, because the heat is felt most in the Arctic Ocean, the very location where some of the most terrifying feedbacks are accelerating local warming, as further explained below. As NOAA writes, much of the record warmth for the globe can be attributed to record warmth in the global oceans, which reached the highest temperature among all years in the 1880–2014 record. 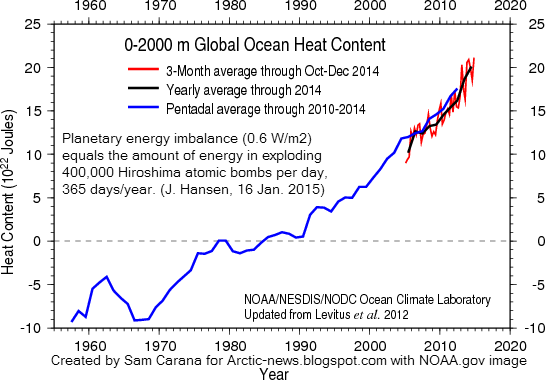 As above image shows, ocean heat reached a record high in 2014. In other words, it was ocean heat that pushed the combined ocean and land temperature to a record high. 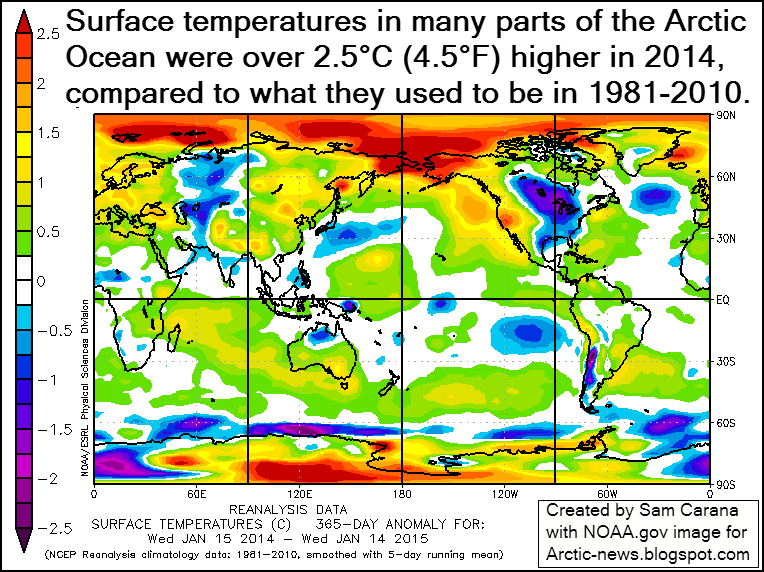 Anomalies were especially high in the Arctic Ocean, as illustrated by the image below. 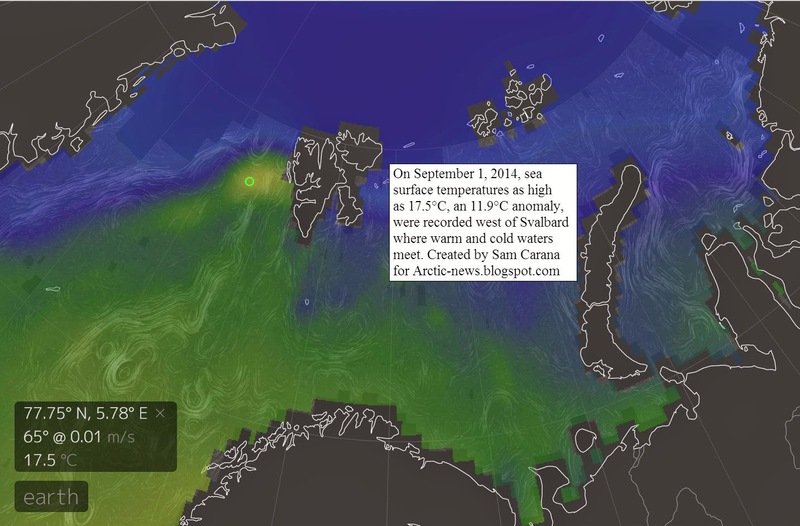 Waters close to Svalbard reached temperatures as high as 63.5°F (17.5°C) on September 1, 2014 (green circle). 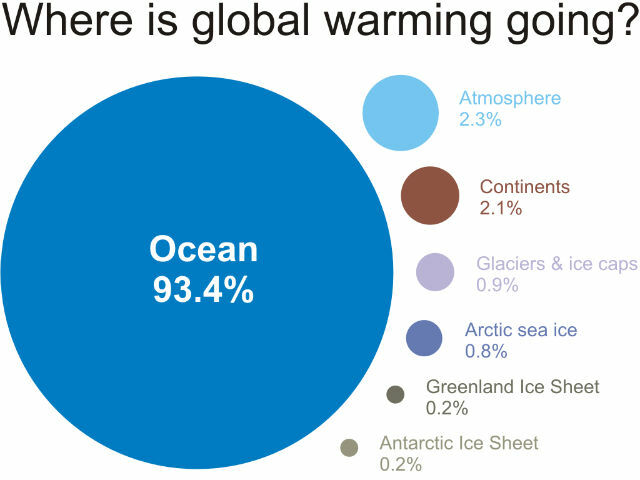 Note that the image below shows sea surface temperatures only. At greater depths (say about 300 m), the Gulf Stream is pushing even warmer water through the Greenland Sea than temperatures at the sea surface. Planetary energy imbalance (0.6 W/m2) equals the amount of energy in exploding 400,000 Hiroshima atomic bombs per day, 365 days/year (J. Hansen, 16 Jan. 2015). Planetary imbalance now is 0.6 W/m2. This has made the rise in ocean heat (up to 2000 m deep) more than double over the past decade. Data from 2005 through to 2014 contain a polynomial trendline that points at a similar rise by 2017, followed by an even steeper rise. What could cause such non-linear rise? The answer is feedbacks. 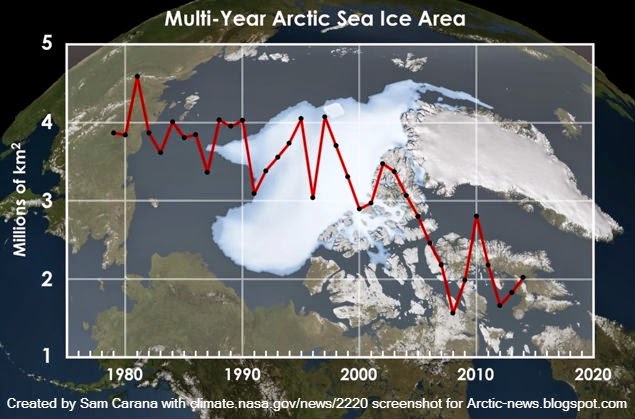 Arctic snow and ice loss alone may well cause over 2 W/m2 warming, warns Prof. Peter Wadhams. 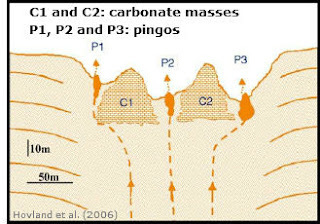 Another such feedback is methane erupting from the ocean floor, as methane hydrates get destabilized due to higher temperatures. As illustrated by the graph below, most of this excess heat is absorbed by oceans and ice. Some of the heat is consumed by the process of melting ice into water, and 93.4% of this excess heat ends up warming up the oceans. Graph by Sceptical Science based on study by by Nuccitelli et al. As the Gulf Stream keeps carrying ever warmer water into the Arctic Ocean, methane gets released in large quantities, as illustrated in the images below showing high methane levels over the East Siberian Arctic Shelf (red oval left) and over Baffin Bay (red oval right) with concentrations as high as 2619 ppb. 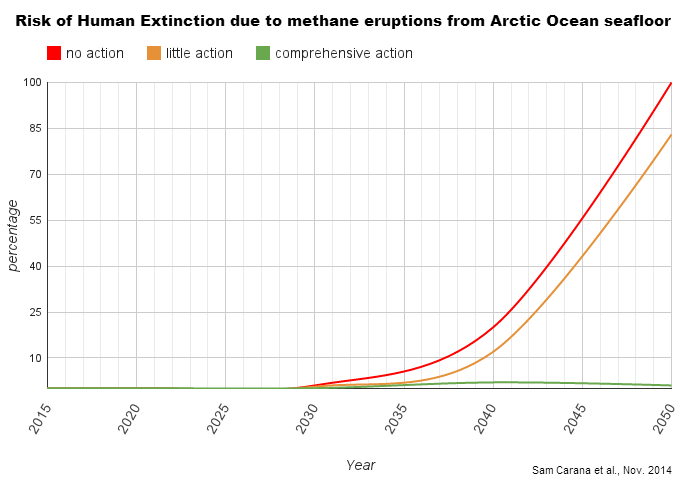 The threat is that huge amounts of methane will erupt from the seafloor of the Arctic Ocean over the coming decades, as illustrated by the image below. For more on this image, see this post and this page. Demise of the Arctic sea ice and snow cover is another terrifying feedback. The image below features a NASA/Goddard Space Flight Center Scientific Visualization Studio screenshot showing decline of multi-year Arctic sea ice area over the years. Below is a video by Nick Breeze who interviews Professor Peter Wadhams on multi-year Arctic sea ice. An exponential trendline based on sea ice volume observations shows that sea ice looks set to disappear in 2019, while disappearance in 2015 is within the margins of a 5% confidence interval, reflecting natural variability. In other words, extreme weather events could cause Arctic sea ice to collapse as early as 2015, with the resulting albedo changes further contributing to the acceleration of warming in the Arctic and causing further methane eruptions from the seafloor of the Arctic Ocean. As the Arctic continues to warm, the temperature difference between the equator and the Arctic declines, resulting in changes to the jet streams and polar vortex. One such change is a slowing down of the speed at which the jet streams and polar vortex circumnavigate the globe, as discussed in a recent post. 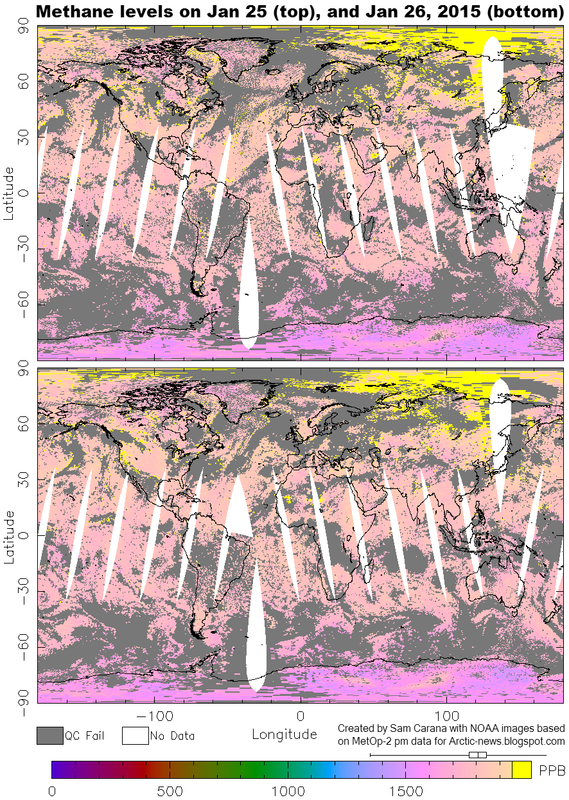 The image on the right shows that the jet streams on the Northern Hemisphere reached speeds as high as 410 km/h (255 miles per hour) on January 9, 2015. Also note the jet stream crossing the Arctic Ocean, rather than staying between 50 and 60 degrees latitude, where the polar jet streams used to be. The image below shows winds on January 11, 2015, at several altitudes, i.e. at 10 hPa | ~26,500 m (16.5 mile), high in stratosphere, polar vortex (left, at 250 hPa | ~10,500 m (6.5 mile), jet stream (center), and at 700 hPa | ~3,500 m (2.2 mile), high in planetary boundary layer. Demise of the sea ice and snow cover in the Arctic results in further acceleration of warming, not only due to less sunlight getting reflected back into space, but also due to loss of the buffer that currently absorbs huge amounts of heat as it melts in summer. With the demise of this latent heat buffer, more sunlight will instead go into heating up the water of the Arctic Ocean. For more on the latter, see the page on latent heat. Above image illustrates some of the self-reinforcing feedback loops that have been highlighted in this and earlier posts. Further feedbacks are pictured in the image below. 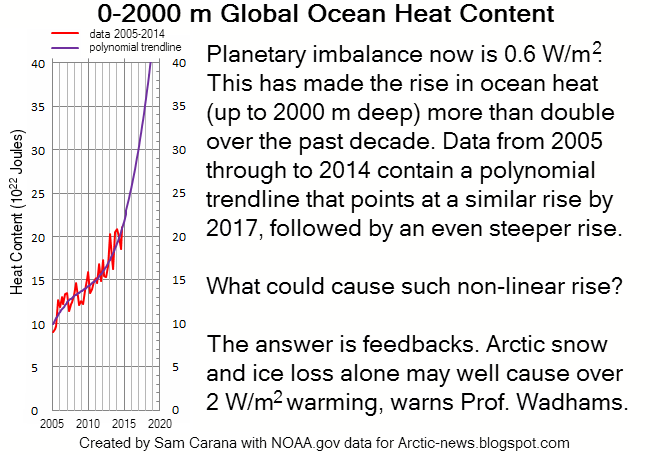 Above feedbacks are already pushing the temperature rise in the Arctic through the 2°C guardrail. 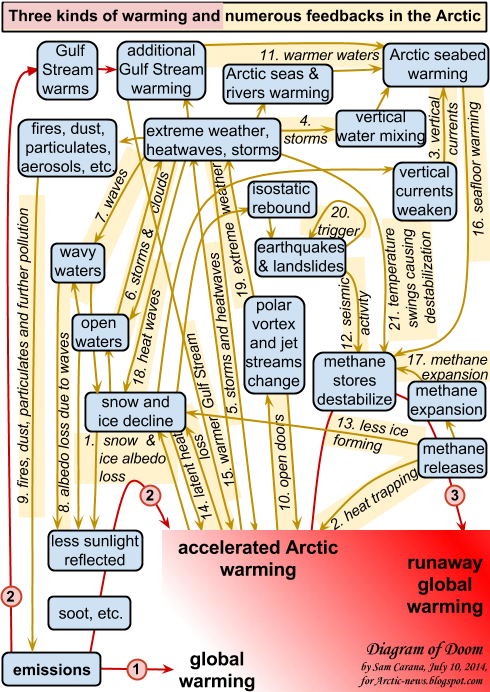 Based on existing temperature data, global warming on land looks set to exceed 2°C (3.6°CF) warming by the year 2034, but methane eruptions from the seafloor of the Arctic Ocean could push up global temperature rise even faster, in a runaway global warming scenario. This raises the specter of human extinction. With no action taken, there appears to be a 55% risk that humans will be extinct by the year 2045, while taking little action will only postpone near-term human extinction by a few years. Only with rapid implementation of comprehensive and effective action may we be able to avoid this fate. 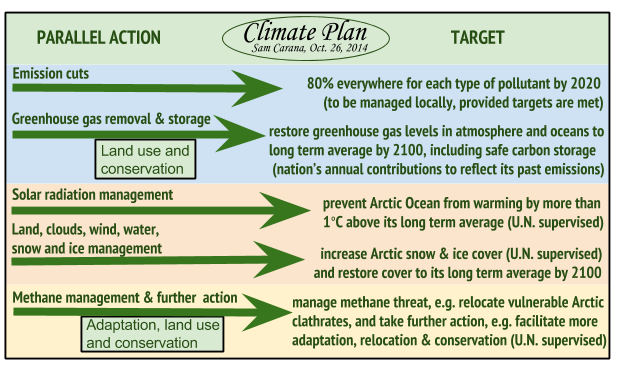 In conclusion, the situation is dire and calls for comprehensive and effective action, as discussed at the Climate Plan blog at climateplan.blogspot.com and as illustrated by the image below. The lateral viscosity of the thin Arctic sea ice cover continues to lower. 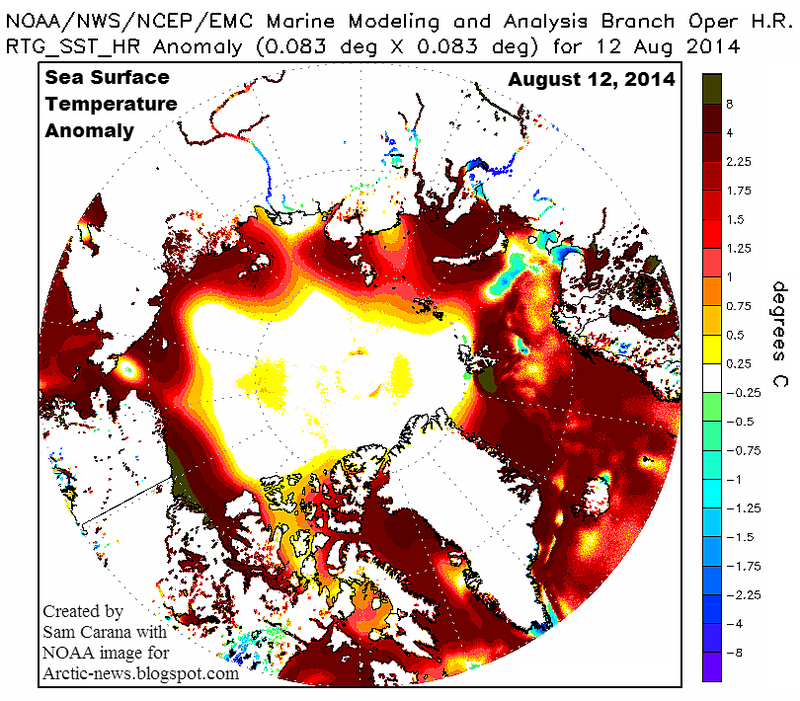 In November just one quarter of the high Arctic Ocean basin above 85° north was covered by a thin this winter's ice. This has now doubled, soon covering two quarters. The ice has been pushed away from Russia towards Canada and to the Fram Strait at phenomenal rates. This is increasingly suggesting that the remaining half in front of the Fram Strait will be sucked into the Atlantic Ocean soon. The dark blue ice is newly formed crushed ice behind the North Pole (pack ice). We may well be in course to the first recorded ice free season in the Arctic Ocean. In addition, the rear is pushed from behind Canada to the Beaufort and Chukchi Seas. We need to act, now. I think we need to monitor this development almost on daily basis. I am curious to see how the ice may behave after the last remainders of the second quarter are sucked into the Atlantic Ocean and the newly forming sea ice will face the force of the Atlantic waves. 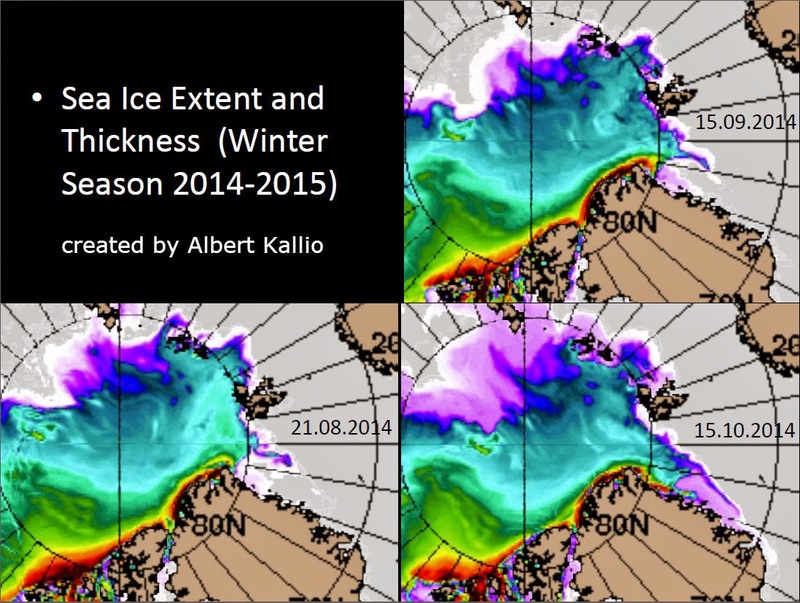 That could mean extremely highly fractured sea ice across the Russian side by the return of spring 2015 sunlight. I think we are witnessing a historic transition right now with no ice in the summers.